The Route 1 doughnut shop is location No. 3 for the beloved bakery. 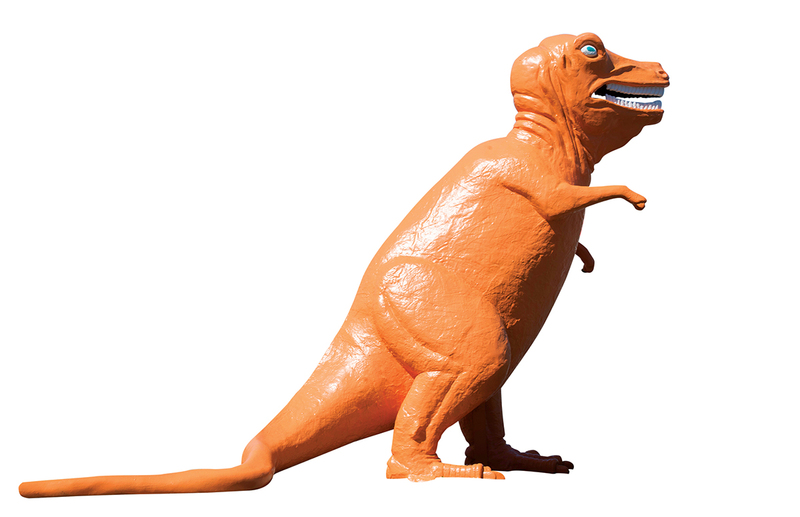 By Jacqueline Cain·	 3/18/2019, 4:51 p.m.
As March winds down with spring-like weather, a new doughnut shop has roared into Saugus: Kane’s Donuts is officially open on Route 1, at the site of the landmark, larger-than-life orange dinosaur. Location No. 3 for the Saugus-born bakery, the new storefront is spacious, bright, and fully stocked with the reigning Best of Boston doughnuts. Kane’s opened earlier this month—with a glowing doughnut sign temporarily affixed to the 15-foot-tall reptile. The illuminated pastry has since been removed, though the property owner plans to apply for the proper permitting to have it return, a Kane’s representative says today. In the meantime, the doughnut shop is open daily at 5 a.m. at the new Essex Landing development. 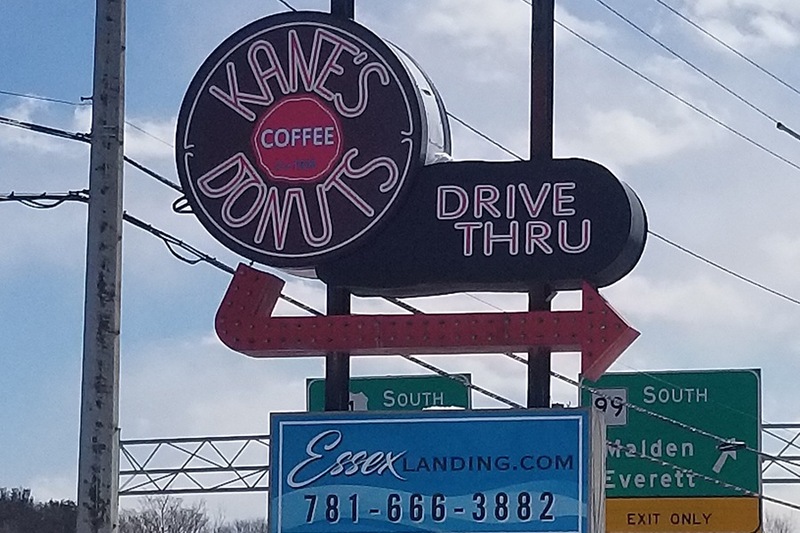 A large, new Kane’s Donuts guidepost fits right in among the rest of Route 1 North’s nostalgia-inducing signage, and it also calls attention to the brand’s first-ever drive-through, which will open in the coming weeks. For now, head inside, where you’ll find tables as well as high-top chairs along the front window to seat 30 people. In the warmer months, Kane’s plans to add 20 more seats outside. Essex Landing currently consists of Kane’s and 39 residential units, but plans call for almost 300 apartments, two hotels, a six-story garage, and more shops across nine new buildings in total. The new construction on the site of a former mini-golf course (the orange dino’s original habitat) gives Kane’s a 3,500-square foot café and kitchen. That’s enough room to move production away from its 63-year-old flagship in a more residential area of Saugus; now all doughnuts for the downtown Boston Kane’s location are produced on Rt. 1. Known for a classic, yeasted honey-dip doughnut, butter crunch, Boston cream, and more creative flavors like cookies-and-cream, Kane’s also rotates through seasonal flavors every month. This month, find a yeast-style pistachio doughnut; a marshmallow-filled pillow glazed with Taza milk chocolate; and a Reese’s Cup special made with local Teddie Peanut Butter. All shops (including the newest) also offer gluten-free doughnuts, cupcakes, breakfast sandwiches, Stumptown Coffee, bottled beverages, and more. Kane’s along Route 1 is open Monday-Saturday from 5 a.m.-9 p.m., and Sundays from 5 a.m.- 5 p.m.
1575 Broadway, Saugus, 781-558-5179; 120 Lincoln Ave., Saugus, 781-233-8499, Two International Place at 90 Oliver St., Boston, 857-317-2654, kanesdonuts.com.